Shaving it right, suave it like you should. Before I start unveiling the shaving piece here, I have a story to share - more like a conversation. Photo by: Mike Kemp, Getty Images. Girlfriend (my girl-friend, non-intimate): You guys always expect us to shave here, shave there, you want us to be smooth and cantek. Girlfriend: You know, we girls shave a lot? Me: That's BS. I shave more than you. Me: But hor, if you don't shave, the hands or tongue running over your skin, later jammed there, how? Me: You every month auntie come visit hor, I every two day uncle lai harass my face ler. You don't understand geh. Me: It's called razor burn lah babe. (........) Sakit sial! Yeah, I don't usually smile when I shave. I don't usually smile during shaving time, I am in pain. Hence, those smiling men holding their razor, looking totally happy, I am like: "really?" Yeah, those does not accurately reflect the shaving scene correctly. Oh well, that's how it got started. And I decided to go ask around some men. So I did some reading, baca sikit and research a bit, and of course, try try a bit lah.... by the way, do you know that an average guy actually shave 5 times a week? I shave about 3 times a week. This is before shaving. I purposely keep it so you can see it obviously on my face. So you have some hair on your face? Don't intend to keep it? No problem. 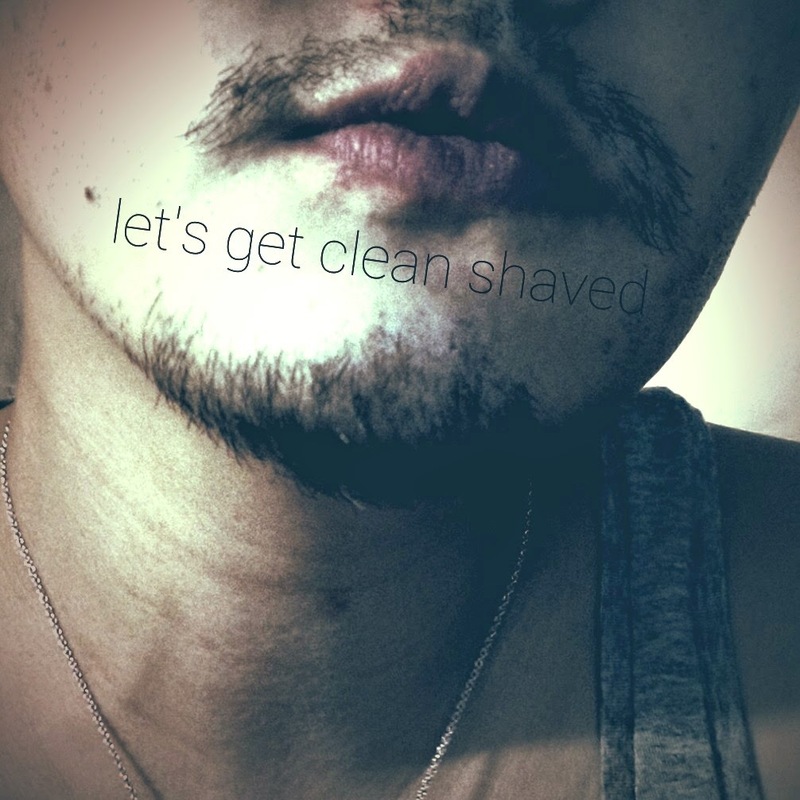 Let's shave it clean but making sure no razor burn and bumps. 1. A damn good razor. FIRST, clean your face with facial cleanser AND exfoliate your face or at least the area you intend to shave - why? Simply because this helps to remove dead skin cells and lifts your stubble for easy shaving. You can also wet your wet towel with warm water to open your pores and soften your beard or moustache, your face will thank you later. Next is to prep the shaving cream or gel. What I use this time is L'Occitane En Provence Gel De Rasage (shaving gel) - as your can see, it's very foamy and soft, I really like the texture. Why? 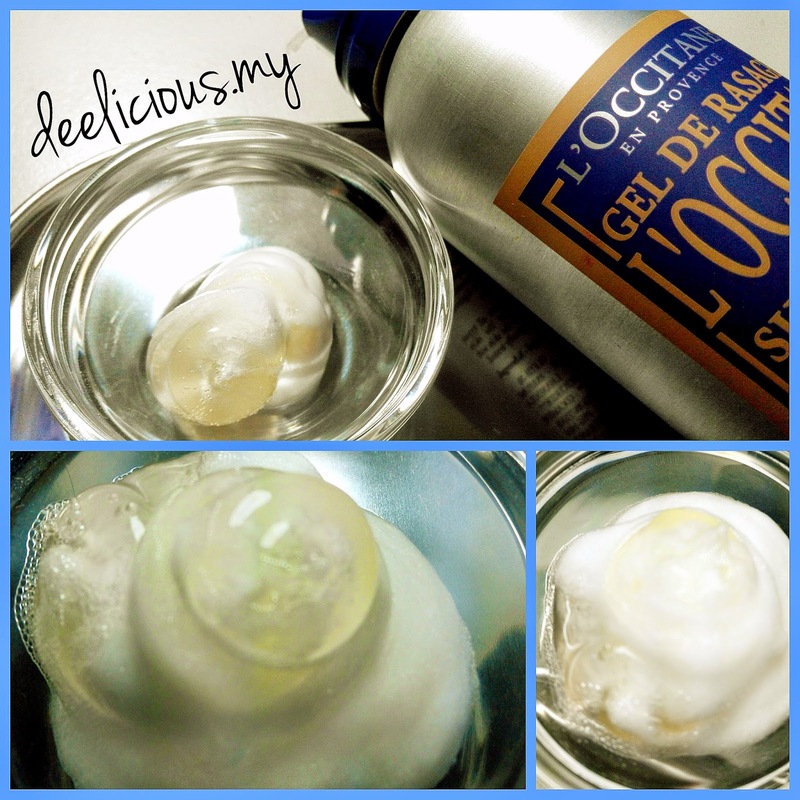 Some of those that I use before, it's foamy but too light, however, L'Occitane En Provence Gel De Rasage's texture is solid, silky soft to skin. The moment you press it out, the gel will transform into silky soft foam! Love it! L'Occitane has quite some variant for you to choose - mine is the shaving gel, foamy and good lather! RM84 for 150ml each, Cade Shaving Cream is RM93 for 150ml each. A bit on this amazing shaving gel, its silky soft texture is a definitely plus point. 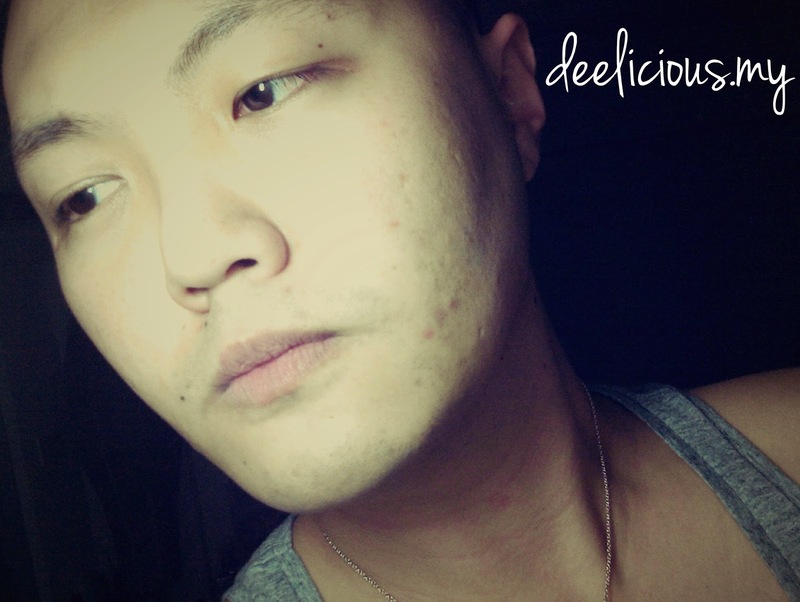 Another thing I like is that it is smooth, allowing the razor to glide smoothly, so not irritation and avoid dryness. It smells really good too! Anyway, once you have the foam ready, use a brush or something like a flat wood spoon (yes, I tried it, it worked) and firmly press the foam against your skin - using tools to help you massage the foam into your beard/moustache, covering all the area really well. You can use your fingers if you are not familiar using tools/brush, just make sure it's really covering your hair well. Next - very important to know this. 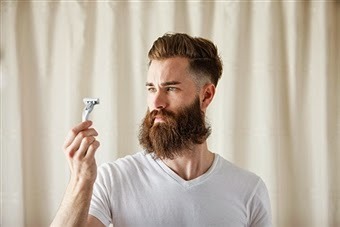 Shave one part completely before moving on to another part AND make sure you are shaving with the grain, meaning if your manly hair grow downwards, please shave downwards, not the opposite. Simple but yet, many men shave the opposite direction because of the perception of "clean shave". NO, it will give you only razor burn easily and you will definitely get stubbles if you shave opposite of the grain. Tried and tested! If you do this correctly, you will get a smooth shave, in just ONE shave, no need to repeat and repeat. Let me show you in 6 simple steps. 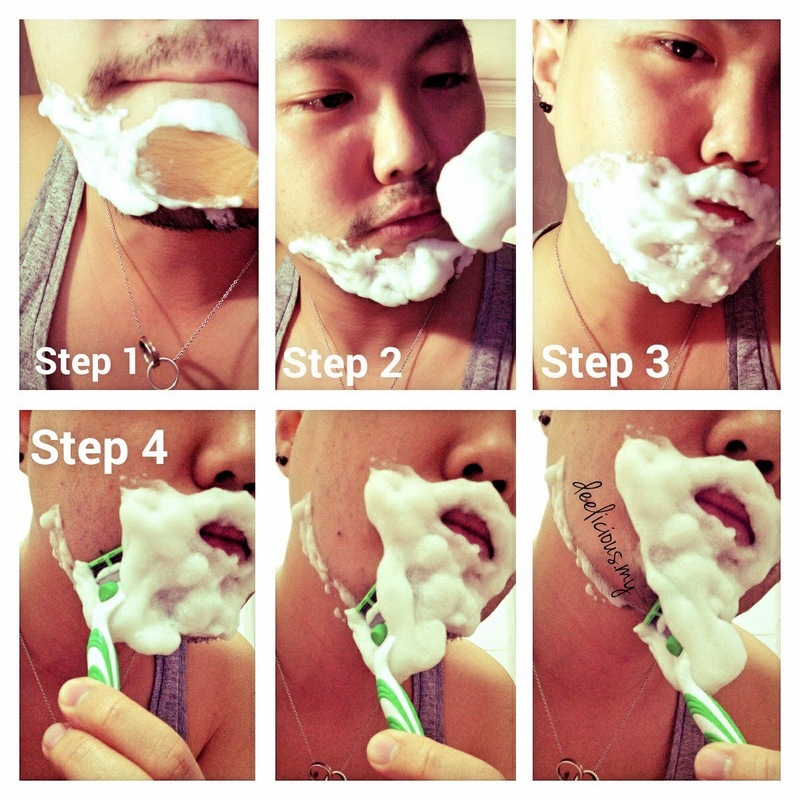 6 simple steps to shave correctly. After shaving all the unwanted hair, time to moisturize your face with after-shave or face moisturizer to protect your skin and avoid the "burn" feeling or dryness on your skin - depends on your skin type. A quick tips for you, instead of warm or hot water, use cold water instead after a shave, so your skin don't feel the burn immediately, cold water helps the skin to cool off a little. This time around, thanks to Melvita, I am currently using Melvita's after-shave and so far, I am very happy with it. 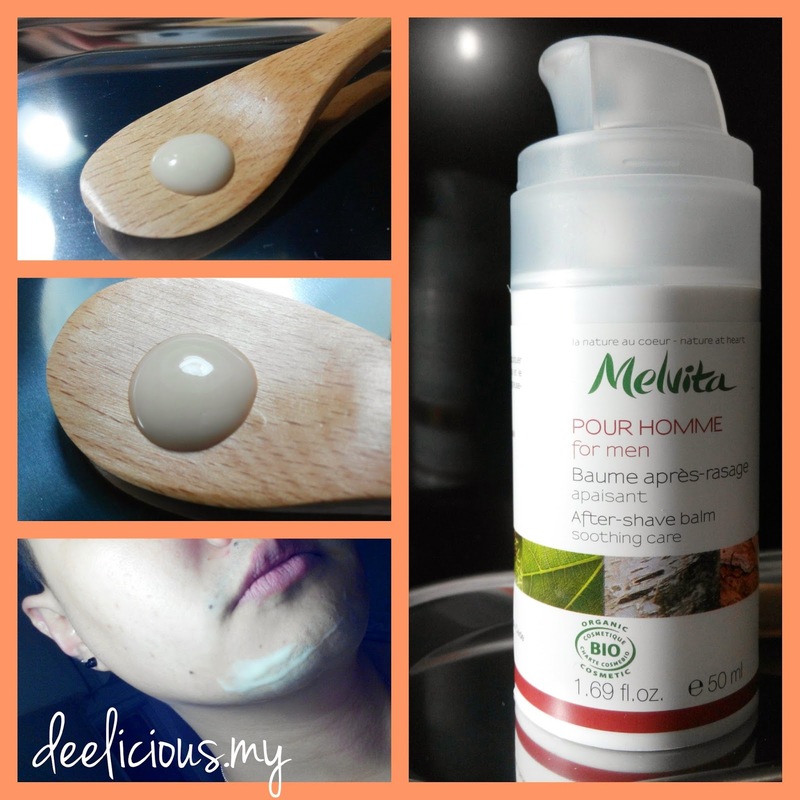 Melvita Baume Apres-rasage Apaisant Pour Homme (Melvita After-shave Balm Soothing Care for Men) is indeed very soothing. I am pleasantly surprised that it has no "cooling" promise like those usual after-shave but it provides a soothing feeling for after-shave, ain't it what we all want? Apparently, it repairs the protective hydrolipidic film damaged during shaving. It has Fig mucilage, Lemon Pectin and honey. Its soothing power is from Candeia and Calendula, while its restoring power is from shea, jojoba, and Cypress nut. Guess what, to slow the growing process of beard, it has a unique complex of papaya, lemon and olive leaves to do this. Since it's organic, it has "natural" smell, but fresh and light - nothing powering. And I myself like it because it's not sticky - some other products that I used before is sticky and I do not like it at all. So, light texture is a bingo! What this product promise is.... no more burning sensations! Which is the sole reason we all use after-shave! Definitely in my must-haves. It has a light texture and absorb quickly. It is RM107 each in 50ml bottle. So, if you follow the steps right, you should not have after-shave issues like razor burn, red rashes, cuts or even pimples, just smooth and nice skin like me (LOL)! No cuts, no stubble, no razor burn, no red rashes. Thank goodness! And I hope this will help you on all the Mondays when you need to look smooth and "I am ready" for the office and all your important occasions. Happy shaving dudes!